Brilliant Belle came back to the barn and cooled out well. She’s adjusting and, as a young filly having been in 3 barns in a month, she’s a little wary. That will pass as she gets used to her new home and surroundings. As you can see from the head shot below, she’s got a very pretty face. Hopefully she stays on the improve and Nevada can move her forward. Below are her lifetime Past Performances as well as her pedigree for those that are interested. I know I’m getting older when I see horses like Turkoman and Gulch back in the 5th generation now! Brilliant Belle, a 4-year old bay daughter of Afleet Alex, is the first runner for the 2017 Club! 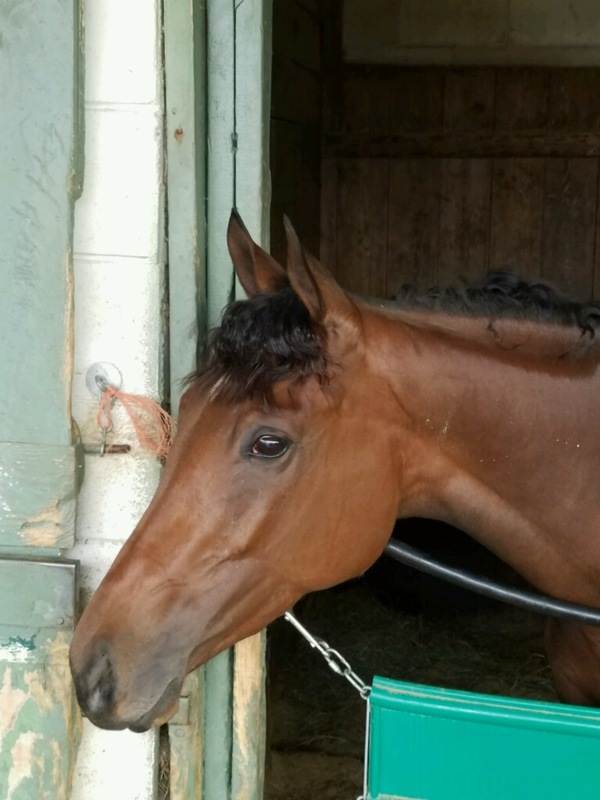 Claimed out of the 5th race at Oaklawn today by trainer Nevada Litfin for $7500, she finished a solid 2nd place after stalking the speed mid-pack in the 6 furlong affair finishing well in her 2nd start off a short layoff. We won a 2-way shake for her as there was one other claim slip dropped. In her short career she has run 13 times, winning twice and now finishing in the money for the 8th time. She broke her maiden at Keeneland in a $20,000 maiden claimer and notched her second win in a $30,000 non-winners of two claiming race at Churchill last June. Nevada will get her back to the barn, cool her out and we’ll see how she’s doing in a few days and plan her first start for us – be it at Oaklawn or opening weekend here at home (if we can get in). I will post her lifetime past performances either later this evening or tomorrow so you can all peruse. Congratulations and Good Luck to us all! Now that we are close to having everything collected and in place, it is time to go shopping. The first step will be to get the Club licensed in the two jurisdictions where we want to get a horse: Arkansas and Illinois. The only individual that will need to get licensed is myself but the group will need to be licensed and we will need to appoint our trainers as “authorized agents”. This means that they can claim on our behalf. The group license runs $50 in each jurisdiction and the authorized agent appointments are $8 in Arkansas and $25 in Illinois. Once that is set and the money transferred we are ready to claim. It looks as if we will have about 150 members this year or $37,500 to shop with. The cost of a pair of horses in training is about $5000 a month. I like to have at least 3 months worth of bills safely in the bank (preferably 4) which leaves us about $17,000 to spend on horses or about $8000 per horse (AR has a 9% sales tax on claims so that has to be figured in as well). With licensing and parameters set, we move on. About 80% of the races held in North America are claiming races or races in which the horses are up for sale. This process was instituted to keep each race as even as possible. You certainly weren’t going to risk your prize stallion if you knew he could be had for just a few thousand dollars! Claiming helps stratify racing and keeps a few good horses from beating up on those less talented. Claiming levels vary greatly around the country. At some country fair and rural tracks the prices can be as low as $1000 while at the larger venues there can be $100,000 claiming races. The bottom line is the same: each horse is for sale for price laid out in the conditions of the race. There is a very specific process you need to go through to claim a horse. It varies a bit from track to track but I’ll outline the generic process below. First, you pick out the horse you want to buy. The trainers and I sort through Past Performances and check on possible targets. They also watch horses in training and on the track where a horse may catch their eye. We’ll be looking for a pair of horses about $8,000 or less for the Club given our budget. Our criteria will be horse that has shown some consistency over a moderate (20 or so) number of starts and one that is perhaps coming from a barn that may not be as accomplished as our trainers’. In other words, something that our teams can improve upon with their training regimen. Second, you check the horse out in person. You can’t walk up to a barn and say, “Hey, I’m going to claim your horse tomorrow, can I have my vet check him out?” but you do want some degree of comfort because, in most jurisdictions, claiming is the epitome of “buyer beware” because once you own the horse, you inherit everything that may be wrong with him. So the trainers will take a close look at the horse as it walks over for it’s race and his behavior in the paddock. If they sees signs of a physical ailment (sore, crooked leg, etc) that could be an indicator of future issues, we pass. If they like what they see, we move onto step 3. Third, you fill out the claim slip EXACTLY and then drop it in the claim box in the racing office or the bookkeeper’s office depending on the racetrack. Any error and the claim is voided. For example, one claim slip was filled out at Keeneland Race Course but on the “track” line, the trainer wrote in “Keenland” rather than “Keeneland”. The missing “e” cost them the horse. The claim box is locked and the claim slips time stamped. Various tracks have different deadlines to have the claim slip in: 5 minutes to post, post time, etc. When the gates open, the claim box is opened and, if you have the only claim in on a horse, it’s yours from that moment forward. Should the horse pick up a check in that race, it goes to the old owners, but should the horse suffer an injury – or worse – in the race, the horse belongs to the new owners. Minnesota, New York, California and Arkansas have rules to protect new owners against catastrophic injury, but very few other jurisdictions. When the horse comes back after the race, a track employee is there with a tag that is snapped onto the bridle and the horse heads off to the new barn. Should there be more than one claim on a horse, a “shake” is instituted. In a case like this, each claim slip is given a number which corresponds to a number on a small pill/ball. The pills are placed in a bottle, shaken and tipped. The number of the claim slip that corresponds to the first pill out of the bottle wins the horse. A horse we were looking at for the Alumni group last year had 16 claim slips dropped on him, for example. Oaklawn, especially, is a real hotbed of claiming activity. Over the next few weeks, this is the process we will follow to try and get at least one – and hopefully two – horses for the Club. We may be successful, we may not and will claim here at Canterbury when the meet starts, but either way the process has begun! If you have any questions, please fire away in the comments section. Remember, the Club is designed to be a learning experience and we presuppose no level of knowledge so there is no such thing as a bad or stupid question! We are in the process of tallying up all the members and should be getting a final count and our starting point this week. Once the list is finalized we can go ahead and get licensed in Illinois (Clay) and Arkansas (Nevada). Then when that is in we can transmit funds into our account at both Hawthorne and Oaklawn and get started looking for horses (though both trainers already have their eyes open). For the folks that are moving on this year, you should be receiving checks in the next few weeks. Later this week I will outline what we are looking for when claiming/buying a horse for the Club. Also, we are planning a kickoff event breakfast where we can meet others in the Club and hopefully watch our horses train so keep your eyes open for that as well. Welcome aboard, thanks for joining us and we look forward to a fun 2017!